WASHINGTON, DC, June 17, 2010 (ENS) – The U.S. Army Corps of Engineers today suspended the use of a fast-track nationwide permit, Nationwide Permit 21, for mountaintop removal mining operations in the six states of the Appalachian region. Now, proposed surface coal mining projects that involve discharges of dredged or fill material into waters of the United States will have to go through the individual permit process to obtain Department of the Army authorization under the Clean Water Act. The individual permit evaluation procedure provides increased public involvement in the permit evaluation process, including an opportunity for public comment on individual projects. Nationwide Permit 21 is used to authorize discharges of dredged or fill material into waters of the United States for surface coal mining activities. The suspension is effective immediately in the Appalachian region of Kentucky, Ohio, Pennsylvania, Tennessee, Virginia and West Virginia. Nationwide Permit 21 continues to be available in other regions of the country. The suspension in Appalachia will remain in effect until the Corps takes further action on Nationwide Permit 21, or until the permit expires on March 18, 2012. This announcement comes more than a year after a March 2009 U.S. District Court decision ruled these permits illegal. The nationwide permit gives a blanket authorization to mountaintop removal coal mines to dump their mining waste in streams and waterways. The District Court ruled that this overly generalized permitting process could not guarantee compliance with the Clean Water Act and that mining companies must apply for individual permits in order to be able to fill streams with mining waste. “We are relieved that the Army Corps of Engineers is finally taking this permit off its books, in a move that is long overdue, but what the Corps really needs to do is change the Bush administration policy that allows the dumping of mining waste in streams and waterways until they are destroyed and buried completely,” said Mulhern. 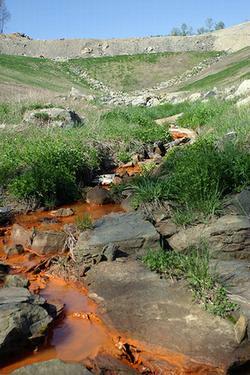 On June 11, 2009, the U.S. Department of the Army, U.S. Department of the Interior and the U.S. Environmental Protection Agency signed a Memorandum of Understanding, with each agency agreeing to work together to reduce the adverse environmental impacts of surface coal mining activities in the Appalachian region. As a part of the MOU, the Corps agreed to issue a public notice to seek comment on the proposed action to modify NWP 21 to preclude its use in the Appalachian region. On July 15, 2009, a Federal Register notice was published soliciting public comment on the Corps’ proposal to modify NWP 21. The notice also proposed to suspend NWP 21 in order to provide more immediate environmental protection while the longer-term process of modification is fully evaluated. The Corps received approximately 23,000 comments during the comment period that concluded on October 26, 2009, of which 1,750 were substantive comments that the Corps says were nearly evenly divided for and against the proposed modification and suspension actions. The Corps determined after a review and consideration of comments that continuing use of NWP 21 in this region may result in more than minimal impacts to aquatic resources. “This joint Army Corps-Environmental Protection Agency rule wiped out 25 years of clean water protections,” said Mulhern. “For the first time, the Bush-era rule officially allowed industrial and mining waste to be dumped in streams, opening the door for more mountaintop removal mining companies to fill streams with the waste from blowing off the tops of mountains to mine coal,” Mulhern said.